Enrico Pieranunzi, Part 4 - "Bill Evans: The Pianist as an Artist"
“When you have evolved a concept of playing which depends on the specific personalities of outstanding players, how do you start again when they are gone?” [Brian Hennessey, ‘Bill Evans: A Person I Knew,” Jazz Journal International, March, 1985, pp. 8-11]. “Ever since his early lyricism Evans had tended toward his natural introspection, and even when projecting strongly he seemed self-absorbed. His first thought was to play music that would satisfy himself, hoping meanwhile that his audience would meet him halfway. Whitney Balliett saw this as Evans’ personal dilemma, “a contest between his intense wish to practice a wholly private, inner-ear music and an equally intense wish to express his jubilation at having found such a music within himself.” [As quoted in Peter Pettinger, Bill Evans: How My Heart Sings, New Haven: Yale University Press, 1998, p. 116]. Instead, it was decided to open the 4th part of the piece with the "Gloria’s Step” chapter so as to allow for a smoother continuance between the parts and also to provide a segue into what came next for Bill, both personally and musically, after the loss of Scotty. 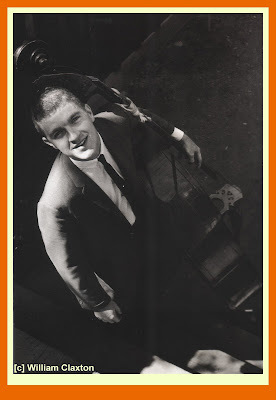 However saddened we were by the tragic loss of Scott LaFaro at the absurdly young age of 25, all of us who love the music of this version of Bill’s trio can take some comfort in the legacy of the two and a half hours of Scott’s genius that was left with us as encapsulated in the Sunday/Village Vanguard Sessions. 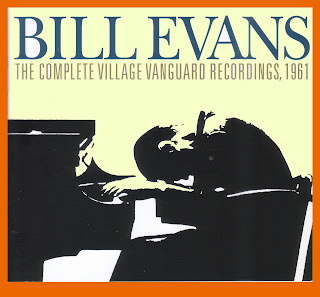 “Delving into the riches recorded … [that Sunday in July, 1961 at the Village Vanguard], we witness a certain apogee in the development of the jazz piano trio, the medium pursued by Evans for his lifetime achievement. For depth of feeling, in-group affinity, and beauty of conception with a pliant touch, these records will be forever peerless.” [Pettinger, p. 113]. 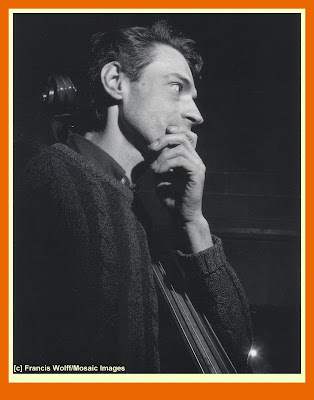 And yet, as Pieranunzi points out in what follows, the loss of Scotty brought forward bassist Chuck Israel and the “birth” of the Second Trio, initially with Paul Motian, but ultimately with Larry Bunker on drums when Paul had had enough of the road and decided to leave the group. 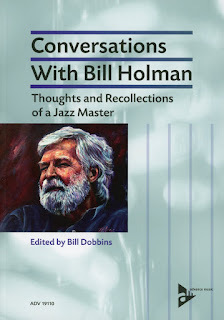 “After a few nights, I got to talking with many of the Hollywood musicians who were coming in to hear us and I paid particular attention to the pianist, Claire Fischer, who kept insisting that the dapper, elegantly bearded man, who I had seen intently listening to Bill’s piano playing, was the most sensitive possible drummer for us to have and that I should persuade Bill to invite him to sit in. To say that the first experience of playing with Larry Bunker was revelation would only be half the story …. I smiled and Bill grinned broadly and Bill dug into play all the more and Larry was hired on the spot to finish the job with us. …" [Quoted in Pettinger, p. 147]. Evans himself found it amazing that LaFaro was so capable of intuiting where he was going, where his next thought was going to be. He wondered, “How did he know that I was going there.” LaFaro's explosive combination of talent, health and exuberant, almost defiant, vitality threw Evans off, putting him face to face with his own personal tragedy - his own human failure. 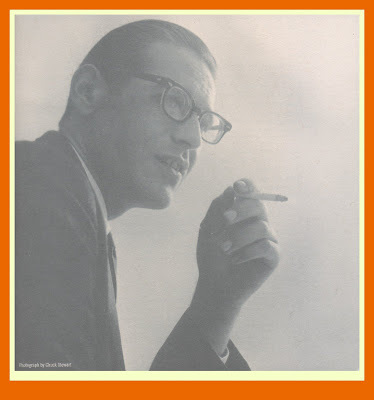 Evans admired the young man but, perhaps, envied a bit that self-confident unhesitating, doubt-free energy that LaFaro expressed both in his life-style and in his music. 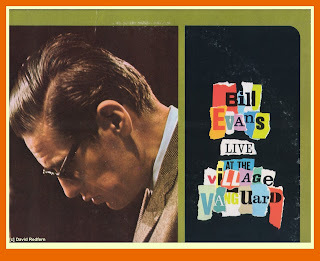 The Village Vanguard Sessions well-illustrates the contrast between the iconoclast LaFaro and the introverted, subtly conservative Evans. 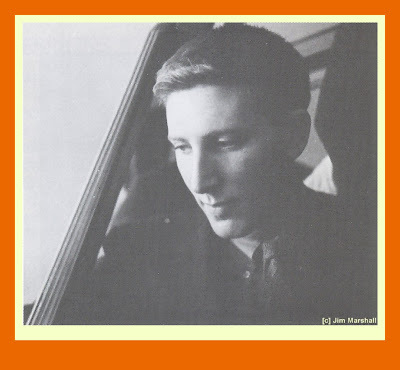 The young bass player who lived life to the fullest “and tasted it down to the last drop wanted more than anything to take risks” (“I don’t like to look back because the whole point in jazz is doing it now.”) This he does with extraordinary results in All Of You, lingering a long time on a very dissonant minor second, that he "walks" confidently along the piece, refusing to stay consonant with the chord flow; or in Milestones, where LaFaro even succeeds in dragging Evans along on a couple of very daring excursions, from which the pianist withdraws immediately to go back to chiseling out his bewitching neo-Impressionistic harmonies. Also in this piece, the bass player seems deliberately to refuse to "walk" in 4/4 in the footsteps of Motian’s orthodox comping, preferring to depart with a solo line of his own that counterpoints what Evans' is doing with his piano. At the end of the tune, LaFaro fools around rather provocatively with some notes, to the laughter of the crowd, while Evans stays locked himself inside his dark, doubt-filled world. “I never listen to the words of songs, I am rarely aware of them,” he told Len Lyons in a 1976 interview. Yet it seems somewhat more than a coincidence that the text of Detour Ahead contains expressions like “You fool, you've set off in the wrong direction,” “turn back while there's still time,” and “don’t you see the danger signs.” Detour Ahead, along with My Foolish Heart, My Man’s Gone Now and Porgy, is one of the ballads that Evans chose to play that evening. It is hard to imagine that this was a purely arbitrary choice. In fact, his interpretation of the song is a truly touching interaction with a tune which he had surely heard Billie Holiday sing, lyrics not excluded. 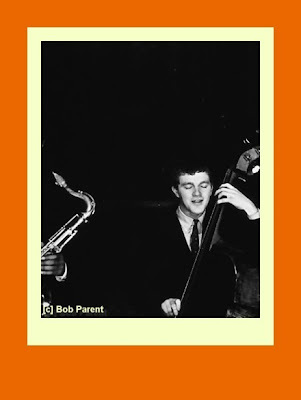 Other roads, with their hidden perils, were waiting to seal Scott LaFaro's tragic fate. At the end of those historic sets, as the three were leaving the Village Vanguard, he had spontaneously expressed with great joy to Motian and Evans, “these two weeks have been exceptional, I've finally made an album I'm happy with!” On the night of July 5 1961, ten days after that magical evening, while going home after a visit to a friend, and having ignored the urgings of pianist-composer Gap Mangione to stay over and leave the next day, he lost control of his Chrysler and went off the road into a tree. Both he and the friend riding with him were killed instantly. Many years later, in 1984, the ever-zealous and thoughtful Orrin Keepnews published other takes from those extraordinary evenings. We find in these the same extremely high artistic level as those performances which even the exacting Evans had considered worthy of publication. These seven rediscovered performances are interesting for several aspects such as, in particular, a greater self-confidence as compared with those on the classic albums originally published from this concert. Perhaps this quality is related to the fact that Detour Ahead, Waltz For Debby, Jade Visions and Alice In Wonderland were revived in their first takes, all of them providing fresher interpretations than the previously published versions. It is as if, in approaching them, the three had experienced that higher intensity of emotion and concentration that almost always happens when you meet up with something that you have not handled for a long time finding it, therefore, somehow "new". In other cases the opposite happens - as in All Of You, for example. The third take of this tune works better, more vigorous and appealing than the "classic" one, which was the second take played on that day. Here LaFaro's playing is more imaginative, provocative and audacious than ever, and Evans sounds more determined and energetic than usual. While the above-mentioned pieces betray a vague sense of boredom after all, repeating a piece after a very short time can, understandably, create a sense of deja vu causing a lowering of interest and a proportional increase in routine - surprisingly, in All Of You the reverse is true. A key element in explaining this may be the presence in the audience of some fellow-musicians at the evening concert, who tacitly stimulated the three to perform at their best. In any case, these seven rediscovered pieces take nothing away and, if anything, only add to the magic of that special evening, highlighting, among other things, the enormous amount of propulsive energy that Motian was able to produce. He swings hard, chancing a more articulated multi-rhythmic approach than in the thirteen "classic" pieces. We feel, almost palpably, how that trio was a living organism: “a three-person voice as one voice,” Motian would say. But now LaFaro was no longer there. That widening of musical horizons that the three had believed they could carry out together those concerts representing a first important leg of the journey - had been rudely interrupted. A musical dimension had now been added to Evans' existential disorientation. Almost like a delayed-action bomb, the effect of LaFaro's death brought Evans down not immediately but gradually, leaving him devastated and more and more isolated. 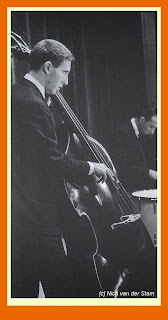 It was the young bass player Chuck Israels, a contemporary and friend of LaFaro's, who would interrupt this process. Israels learned of Scott's death while in Italy playing in the "pit" at the Spoleto festival in an orchestra for a ballet by Jerome Robbins. Although deeply grieved by this loss, Israels felt that he was good enough to fill the position that LaFaro had left vacant. The young, enterprising bass player knew there weren’t many alternatives around for Evans and, besides, this was something that he had always desired. 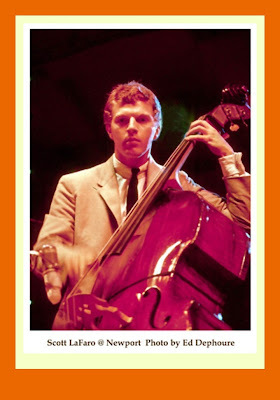 There were, in reality, two other bass players with a solo style that had absorbed the LaFaro approach who were moving in a direction which could have made them appealing to Evans; but it wasn't easy to get to them. 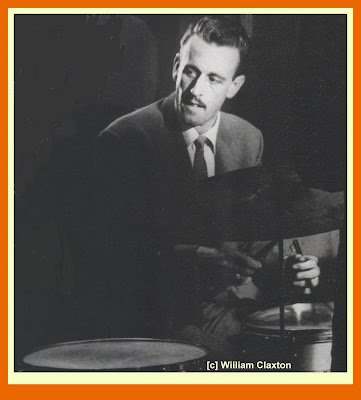 One was Albert Stinson, very young at the time, who was to emerge shortly in a group with Chico Hamilton and who, by an incredible twist of fate, would pass away in 1969 at the same age as LaFaro; the other was Steve Swallow who, in 1961, had been the bass player on George Russell's Ezz-thetics. 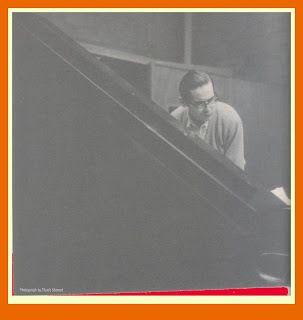 But Israels got the job and, in early '62, Bill Evans' "second trio" was born. He had more than a few doubts. With LaFaro the trio had reached such musical heights, in concept and performance, that going any further was almost impossible to imagine. Still Evans and Israels began to meet and play together, entering into a less than easy relationship that, nonetheless, slowly brought the pianist's musical life back into focus. In the autumn of that fateful 1961 he had recorded as sideman with singer Mark Murphy and vibes player Dave Pike. In December he took part, with Israels and Motian, on an album by flutist Herbie Mann. But he didn't feel ready yet to record with a trio. It wasn’t until May of 1962, with the gracious but firm insistence of Orrin Keepnews, that he agreed to enter the studio to record for the seventh time under his own name. Israels, as compared with LaFaro, was another thing altogether. Although less spectacular (besides, who could ever have equaled that genius?) he proved, in his four-year collaboration with Evans, a remarkable musical intelligence, a highly developed capacity to deeply feel and interact with the expressive moods of his leader, and a solid, dynamic swing as well. These qualities contributed greatly to his overcoming Evans' doubts and put him back on the road to developing his trio. The group would never reach the peaks that it had with LaFaro, but often was to offer some very valid examples of a "modern" trio. The experimental approach of the period 1959-61 having already been tested and approved, Israels managed to place himself as one of the three voices of a group where interplay was by now common procedure. 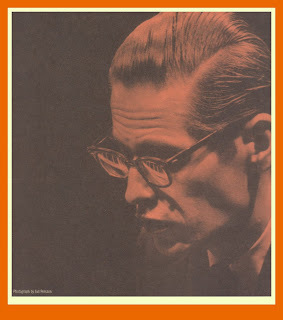 In spite of a lower degree of authority and rhythmic/harmonic audacity than LaFaro, Israels was capable of not limiting himself to the standard role of accompanist, and to not passively seconding what the pianist was doing. Some even saw in the arrival of Israels the possibility for Evans to finally take the situation in hand and show the determination of a true leader; a strength that had previously seemed to emerge only in some of his performances as sideman (Russell's celebrated All About Rosie is a good example), and which LaFaro's fiery, irrepressible energy may somehow have impeded. 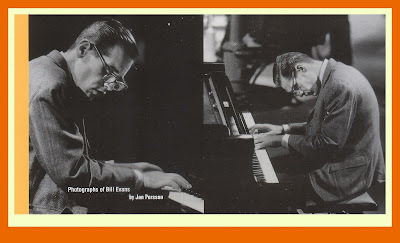 Yet others believe, to this day, that Israels' parsimonious and ponderous style worked better for Evans than that of LaFaro, and that, beyond any doubt, the new collaboration with Israels produced superior artistic results. Both theories contain a grain of truth (even though, naturally, it would cast some shadow over the previous "happy marriage" with LaFaro). Israels' playing, in fact, was essential, and never went out-of-bounds as LaFaro's could sometimes seem to go. He pushed Evans to tell his musical stories "completely', without interfering with them, and did not force the pianist in directions where, perhaps, he did not want to go at that particular moment. Precisely for this reason perhaps some of Evans' albums with Israels and Motian, or with Larry Bunker on the drums, reach artistic peaks just as high as those of his period with LaFaro. Of course, after LaFaro's death, the innovative impetus in which he had involved the reluctant Evans came to an abrupt halt. No link, not even an indirect one, existed between Israels and the most experimental expressions of the time (Coleman, Dolphy, etc.) The new bass player did not oppose Evans' conservative tendencies, on the contrary he adapted himself. But the twofold pressure of Israels and the state of his finances brought him back to music. He had no choice - he needed money - and his main point of reference was none other than Keepnews himself. He was constantly asking for advances and usually the producer gave in, but not without some compensation - and this meant recordings. The risk, of course, was a sort of unplanned, mass-production which neither of them, for different reasons, wanted, but the situation offered few alternatives. So 1962 ended as one of Evans' most intensely active years in the recording studio with him working hard to repay Keepnews' generosity. He heavily increased his compositional activity, to the extent that he would carry his music notebook with him at all times, where ideas and themes could be tossed down on the road or during breaks in club performances. Show-Type Tune was practically completed on a New York subway train. On the albums that mark Evans' return to trio work (How My Heart Sings RLP-9473; OJCCD 369-2) and Moonbeams RLP-9428; OJCCD-434-2) three of his original compositions appear for the first time on a recording: Walkin' Up, a fast piece with harmonies not unlike those which John Coltrane had been exploring for some years; 34 Skidoo, in which, with a vaguely French dance-mood, three-time sections animated by a searching restlessness, alternate with others more static in four-time that seem to arrest that sense of cyclical loss", that dizziness, that certain waltzes have; and finally, Re: Person I Knew, a piece among the most representative of all Evans' production. Here, against a bass pedal that remains throughout the piece, Evans lets loose a series of scales that respond to one another in a question-answer/tension-rest dialectic. However, in the midst of all this darkness, a meeting was to take place in that year that would change his career. Lees had asked his girlfriend, Helen Keane, to consider becoming Evans' manager. At the time she was working on behalf of the singer Mark Murphy, and had had a part in launching the careers of artists such as Marlon Brando and Harry Belafonte. Lees invited Helen to hear Evans play and she was so deeply moved by what she heard -“Oh no,” she said, “this is the one that could break my heart” - that she immediately agreed to be his manager, becoming over the years one of the most decisive people in Evans' artistic career. “[In 1962] Circumstances were forcing Bill to widen his sphere of musical activity. The trio was no longer the only group requiring his attention. 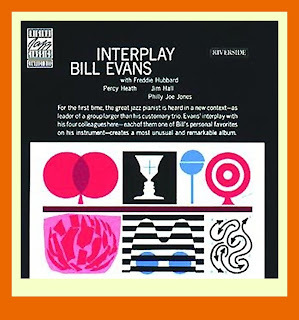 In addition to his increased compositional activity, in July/August of 1962 Evans recorded two splendid quintet albums which were originally issued as a single LP called Interplay [Riverside LP 9445] and subsequently as a double LP entitled The Interplay Sessions, [Milestone 47055] and that later became the CDs Interplay [OJCCD-308-2] and Loose Bloose [Milestone 9200]. Bill chose which instruments there would be in each band using trumpet, guitar, and piano-bass-drums on Interplay and saxophone, guitar and the same rhythm section on Loose Bloose. ‘Who’ was playing on these dates is something that Bill kept closely in his focus as he was developing the music for these dates. 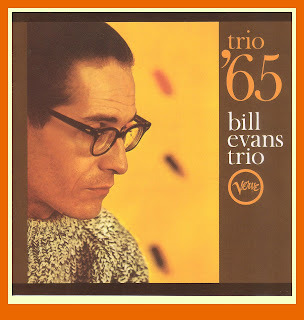 The musicians common to both recordings, drummer Philly Joe Jones and guitarist Jim Hall, were Evans’ preferred performers on their instruments. The trumpet player on the first recording was the then emerging Freddie Hubbard, while on the second LP it was Zoot Sims who had risen to prominence as one of Woody Herman’s ‘Four Brothers’ at the end of the 1940’s. The most relevant factor of these two albums lay precisely in Evans’ ability to match the material to the color and tone of the instruments that he had chosen for these sessions. 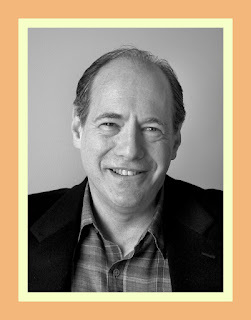 Both albums highlight his talent as an arranger, one who is able to treat a small group like a big band. In some selections, the theme is presented by the trumpet and guitar using the latter as a sort of second horn; in others, the guitar is phrased with the other string instrument, the bass. The order of the solos is sensitively conceived to avoid monotony. And, with this in mind, the instrument that states the theme at the beginning does not play it again at the end of the piece, thus maintaining a lively variety in tone color within each number. 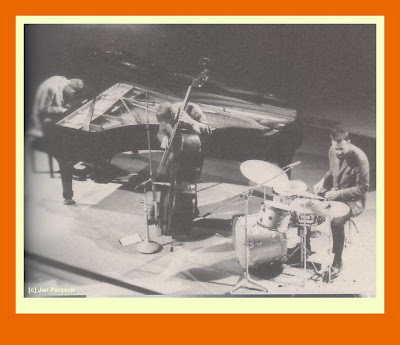 From the point of view of Evans’ piano language, these albums marked a successful attempt at regaining that vitality and performing energy that seemed to be missing with his second trio [based on the preceding chapter, Pieranunzi seems to be referring to the trio in which Chuck Israels replaced Scott LaFaro with Paul Motian remaining as the trio’s drummer until her left Bill in Hollywood in 1963]. Working out of Philly Joe Jones’ generous rhythmic pulse, he recaptures in some solos that hard bopper verve demonstrated in New Jazz Conceptions and Everybody Digs Bill Evans. In particular, Wrap Your Troubles in Dreams – a title which is perfectly appropriate to the difficult period in which Evans perhaps yearned to shed his problems and dreamed of a better life – there is an almost joyful simplicity in the phrasing. It is as if Evans was searching back in time for his personal ‘golden age’ when, as a teenager, he had discovered and learned to love Jazz. The melodies of the album on which Hubbard plays are all from the late 1930s, and perhaps this is no accident. Evans up-dates them, inventing delightful, unpredictable and unconventional codas for each one – to the point that the ending of You Go To My Head sounds harmonically unresolved and erratic. All things considered, Interplay is a very hopeful album. Furthermore, this being an occasion to lead a group larger than a trio, Evans does something really intriguing which is reflected in the two title-tracks, Interplay and Loose Bloose. In both numbers, the minor blues form is combined with an approach the pianist owed to his exposure to the music of Bach. These two tunes are, in fact, very close in their construction to some of the great composer’s works: a sequence of tenths as played by the guitar and bass forms a calm and almost solemn harmonic framework while the melody unfolds in counterpoint to it. Loose Bloose, written in the unusual key of E-Flat minor, also offers a demonstration of melodic daring uncommon to Evans. Here he makes use of often dissonant intervals which trace a flickering, zigzagging line by frequently zooming-out in wide leaps. Less successful was his attempt at fusing classical procedures with an exclusively jazz context. Fudgesicle Built for Four [another of Evans’ pun titles obviously playing off the title of the song Bicycle Built for Two] is a real “fugato” where each of the four voices enters one after the other, according to the most rigorous imitative style. The result is a very Dave Brubeck-like jazz, with a slightly pompous, tuxedoed “Modern Jazz Quartet” flavor, but unfortunately, the harmonic structure laid out by Evans for improvisation on the tune seems to inhibit the soloists. Essentially, the Interplay album with Freddie Hubbard can be considered a hard bop release with Evans even dusting off a few Horace Silver type passages. 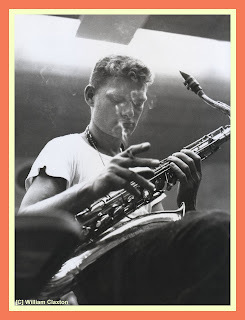 On the other hand, the Loose Bloose with the sensual and splendidly relaxed tenor sax of Zoot Sims evokes a decidedly “cool,” vaguely Tristano, atmosphere, especially when Evans assigns some lines to the sax/guitar combination creating a sound very close to the Konitz/Marsh/Bauer ensemble of Tristano’s best known recordings. It is precisely Sims’ seductive instrumental tone that marks the expressive character of Time Remembered, a piece which Evans recorded for the first time in an August, 1962 session and which would always remain one of his most well-known and well-loved pieces. Time Remembered introduced into Evans’ compositional work another important facet of his classical background: the subtle evocative/narrative flavor of post-Impressionism. In this uniquely lyrical composition it is the song, the melody that seems to push the harmony creating, especially in the third section, chord relationships highly unusual for the average jazz composition. Thanks to the refined use of enharmonic links or what Bill Evans himself called ‘diminished relationships,’ tonalities far removed from each other find unexpected connections, creating in the listener a sense of surprise and discovery that, despite the slow tempo and softness of the piece, makes for an effect that is anything but static. 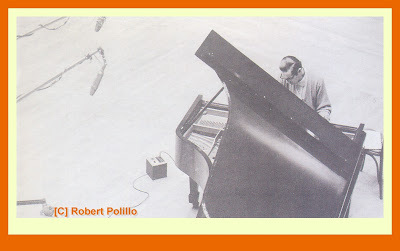 This over-dubbing technique was not entirely new to jazz: Lennie Tristano, in fact, had done the same thing in the 1950s, causing no small stir among the critics at the time, The peculiarity of the thing spurred Evans, however, to clarify his intentions in the album's liner notes, in which he said that he considered that strange "trio" a ”group"; for all intents and purposes it was a collective improvisation. Naturally the album demonstrates Evans' great capacity to carefully balance the three piano parts, even though the impression of artifice and of "personal challenge" prevail throughout its artistic content which, once again, seems necessarily to come to the foreground in relation to the pianist's "dark side". N.Y.C.’s No Lark is conceived as a sort of dirge-like song in memory of the young pianist Sonny Clark who, tragically, had recently died as a result of drugs. The agonizing atmosphere of the piece, constructed as a kind of heavy funeral march in which Evans, using Debussy-like harmonies, refers to the more hidden, destructive aspects of a city like New York which (and for Evans himself it was, unfortunately, the same story) could easily become a painful and oppressive place. However, beyond the virtuosity Evans showed in handling a decidedly complex musical situation and his ability to "orchestrate", it seems rather to represent a curiosity along his musical path than a significant point of arrival. Three months later, in May of 1963, going along with Creed Taylor's often disputable taste, Evans recorded an album for MGM on which his performance consisted simply of playing famous Hollywood themes according to the most banal and simplistic parameters of elevator music. Despite the slick presentation in the liner notes (“Evans can explore a pop tune and give it a dignity and meaning it never received before”), the album collapses into a completely conventional, commercialized product, whose total disengagement was in deep contrast with the constant appeal to beauty that Evans was always making in his statements. Evans restricts himself to playing the melody of the pieces in the most pedestrian way imaginable, succeeding in coming dangerously close, if not in fact crossing over, into the style of sequined ballroom entertainers. Evans, aware of this self-annihilation and, disturbed by the whole thing, thought at first of hiding behind his Russian name, but after releasing the album he rationalized that “if this record could have done something for widening my audience, getting better distribution for my other records, I'm all for it. Because it's a cold, hard business.” His hopes of making money, however, didn't pan out but somehow, perhaps in spite himself, he managed to avoid ruining his artistic image forever. 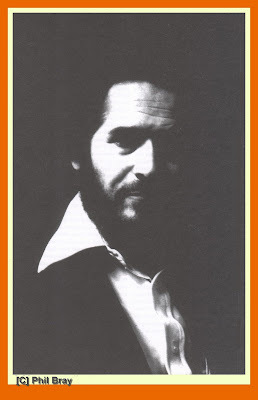 The brilliant arranger Claus Ogerman had been brought in for the occasion, and would go on to work with Evans on various other recording projects, the most successful among which the album Symbiosis in 1974. At the end of May, 1963 Evans gave a concert at the newly-opened club Shelly's Marine Hole [Riverside RLP-9487; OJCCD 263-2] in Los Angeles. 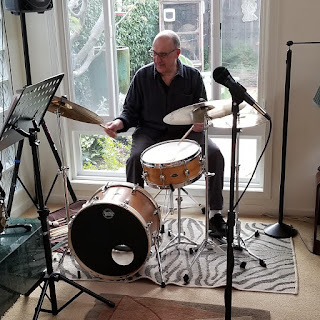 On this occasion the pianist agreed to try out Larry Bunker, a Californian drummer - but also a very good vibes player - who before then had done both studio work as well as jazz activity of a very high level, playing with greats such as Art Pepper, Gerry Mulligan and Peggy Lee. Bunker was an able drummer in his use of the brushes and quite sensitive in listening to his two partners. His swing was incisive and his cymbal work combined both precision and imagination. Evans was impressed and hired him for his trio. The live album shows an Israels clearly evolved, compared with the shy bass player of "Moonbeams" and "How My Heart Sings" of the previous year. The trio seemed to have found a new equilibrium, with Israels and Bunker maybe not exactly "flying", but deep enough to give Evans the solid, calm, supportive tranquility he needed. His repertoire in those years remained more or less static. He composed very little, performing, at least up until 1966, his compositions previous to 1962, along with standards and pop songs, every now and then adding on a new one. Only occasionally did he take on the blues (the splendid Blues in F and Swedish Pastry on the live album at Shelly's Manne Hole, for example), reinforcing his image as the introverted, romantic and solitary musician. 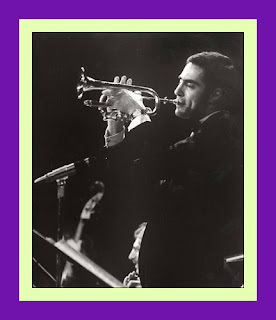 Something noteworthy was happening in those early 60s: Evans music was settling down into something less audacious than what he had done with Miles Davis or Scott LaFaro while, at the same time, his fame was growing, almost as a delayed reaction. As clear proof of this fact, in 1964, deposing the perennial Oscar Peterson, he was voted best pianist in the Down Beat critics' poll. Unfortunately, in the same year his long-lived collaboration with Paul Motian came to an end. As a kind of farewell, the drummer left a last taste of his enormous personality and creativity on the album Trio '64, which included the extraordinary, barely more than 30-year-old, Gary Peacock on bass. Motian felt that the trio's music had become static, “tired", no longer innovative, even retrogressive (put more drastically, “cocktail lounge music),” and this album proves he was right. Evans' interest in interplay, in the breaking down of the rhythmic/harmonic confines in jazz language, seems here to have completely vanished. However, Peacock is revealed as the real possible successor to LaFaro. His solos are daring excursions, in which the given harmony of the theme does not serve for "agreement" but for opposition. 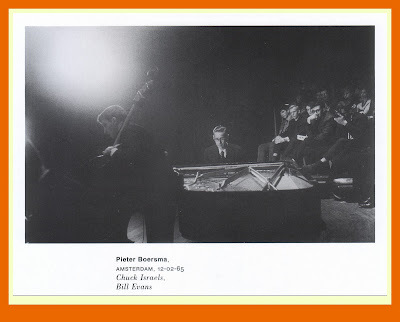 His irrepressible energy seems, as had happened with LaFaro, to make Evans uncomfortable, who goes off into a corner to listen to his partner's exuberant soloing, almost incredulous at so much iconoclastic vitality. 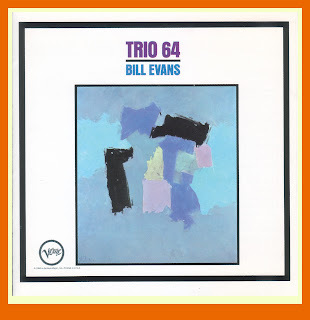 On Trio '64 [Verve CD 815-057-2] Evans seems to refuse any compliance with Peacock as well as with the ingenious, unconventional initiatives of Motian. He keeps himself shut away in his reassuring world of sound and does not risk encounter with what his two partners are saying, Even Evans' proposal of a lighter, even playful, repertoire (Little Lulu and Santa Claus Is Coming To Town), a sort of way to musically translate his penetrating and sedate humor, and an attempt to give a witty and joyful image to his music, is unable to make the session an artistically successful one. And so, this album turns out to be a missed opportunity, one which would never be repeated. That kind of dialogue, which had been arrested back on June 25th 1961, would never be fully embraced by Evans again. Motian went on to dispense his genius among the likes of Paul Bley and Keith Jarrett, to then expand his musical quest both as composer and as band leader in the mid-1980s and through the 90s. Peacock, after his brief stint with Evans, joined Albert Ayler and Don Cherry, two of the most outrageous representatives of the jazz scene of the mid-1960s. By the mid-60s Evans was beginning to be more visible on the European scene. In 1964, along with Israels and Bunker, he made a successful tour of Scandinavia, where over the years he was gaining increasing fame and popularity among jazz fans. The following year he went to France, where he would return many times and where his art has continued to be highly appreciated. The assistance of Helen Keane, by now his artistic "counselor" in addition to being his manager, was starting to bear fruit. Thanks to her Evans was able to win himself an affectionate audience at a time when the prevailing trends in jazz were going in a completely different direction, and in which the dominant and most influential figure on the scene was still that of John Coltrane. The recordings he was making with Israels and Bunker in those years were of uneven quality. The performance modules of the three had crystallized into a tension-free approach which was naturally affected by Evans' aesthetics and choice of repertoire. "Trio '65 [Verve CD 314 519 808-2]" is by far the most representative product of this period. 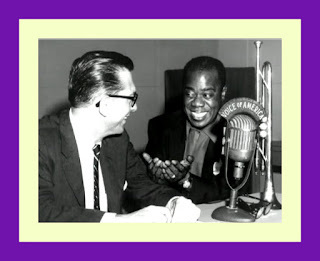 Here Evans recorded, for the first time, a song that he had recently discovered, Who Can I Turn To?, which he seems to mold into a composition of his own. One of the album's peaks is his interpretation of Monks 'Round Midnight, which he "Evansizes", entering with authority and delicacy into a world he had always deeply admired. ... to be continued in Part 5. 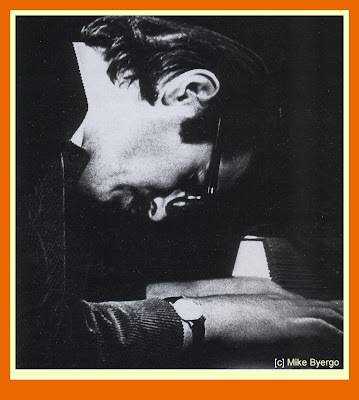 Enrico Pieranunzi, Part - 3 "Bill Evans: The Pianist as an Artist"
Over the years, much has been made of the album Kind of Blue by the Miles Davis Sextet, and deservedly so. From any number of perspectives, it is a landmark recording, one that changed the course of Jazz. By employing a series of modes or scales as the basis for the improvisations on the album’s tunes [instead of the usual chord changes] stylistically, the music on this recording created another manner or approach in which Jazz could be played. By the late 1950’s, “running the changes” [chords] had created an improvisational log jam for some musicians with the result that they began looking for a way of adding space to help restore some breathing room in the pace of improvisation. 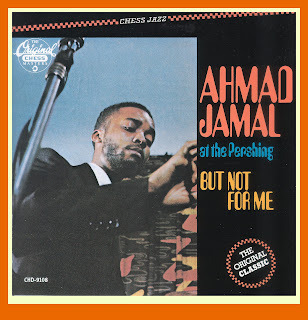 With his live recordings for Argo at the Pershing Room [Lounge] in Chicago, IL and the Spotlite Club in Washington, D.C., one musician who employed a style that avoided the hectic and frenetic pace of bebop and its hard bop counterpart was pianist Ahmad Jamal. Dismissed at the time by many of the reigning Jazz critics as little more than "cocktail music" or, perish the thought, "commercial" recordings, the immensely entertaining music on these recordings displays an individual virtuosity and group cohesiveness that is easy to respect but difficult to emulate. Careful consideration is given to the arrangement of each tune and Ahmad Jamal's orchestral approach to the piano is beautifully complemented and underscored by the sensitive, yet always swinging bass work of Israel Crosby and the rock soild drumming of Vernell Fournier [with a name like that would you be surprised to learn that he was from New Orleans?]. 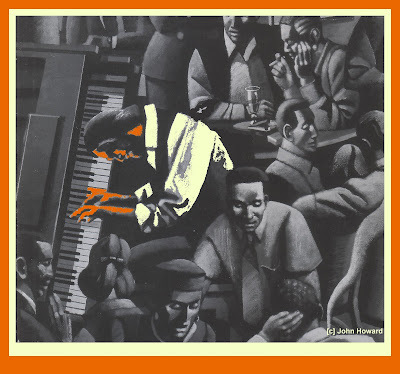 Speaking of "surprise," to use Whitney Balliett’s famous term, "the sound of surprise" is everywhere apparent on these recordings as Jamal allows the time to flow while darting in and out with improvised statements instead of running the changes with bebop lines played with the right hand in the style of Bud Powell. 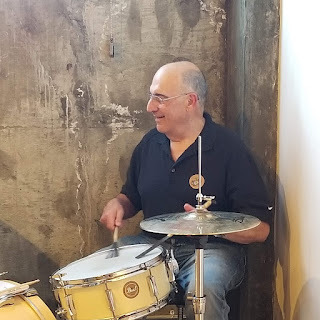 Vernell Fournier's use of a tympani mallets and open high-hat cymbals played in the manner of finger cymbals on the tune Poinciana created, according to Jeff Hamilton what drummers would thereafter referred to as "the Poinciana beat." These recordings had a far-reaching effect on many Jazz musicians during this period especially with their introduction of new uses of space and time and what could be called the sound of silence [ the soloist "laying out" and just letting the bass and drums "cook"]. One musician who was very much taken by the openness and airiness of Jamal’s music was Miles Davis and he began looking for a way to incorporate it into what he was doing. While Jamal’s approach created space in the music, Ahmad was still playing tunes that were based on traditional chord changes which he essentially interrupted or interjected with intervals of space, rhythmic vamps and/or sporadic improvisations to alter the pace of things. 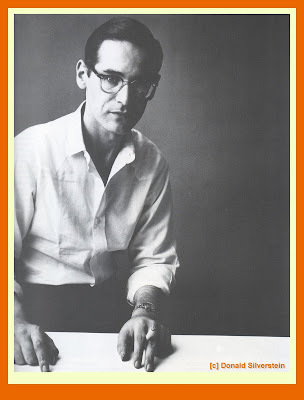 Through his own studies and deliberations, as well as, his work with composer George Russell who employed the Greek Lydian mode as the foundation for many of his orchestration and voicing techniques, Bill Evans was able to provide Miles with an alternative basis for improvisation – The Greek Modes. In music, a scale refers to an ordered series of intervals which, along with the key or tonic, defines the pitches. However, when a mode is used in music to mean a scale, it applies only to specific diatonic scales and gives these a different tonal center. The Greeks used seven  modes. On piano, one can find their diatonic scales by using the white keys only with the result that the seven note scale starting on C is an Ionian [mode] scale; starting on D gives a Dorian [mode] scale; starting on E a Phrygian [mode] scale; starting on F a Lydian [mode] scale]; starting on G a Mixolydian [mode]scale; starting on A an Aeolian [mode] scale; starting on B a Locrian [mode]scale. Ionian, Lydian and Mixolydian are major and the other four are minor. Jamal’s use of space along Bill Evans’ application of modal tonal centers provided Miles with the basis for opening up the music and gave to it the “lightness of being” that he had been searching for, all of which was to ultimately manifest itself on the landmark Kind of Blue album. It is also important to keep in mind that in Jazz, the modes correspond to and are played on particular chords. The composer can create conventions or rules for the way in which the modes or scales and their related chords are used. For example, when improvising, the soloist can stay [improvise] as long as he/she wants on the modal note and related chord before releasing and going on to improvise on the next one. Or the improvisation may be set up to oscillate back and forth between two modes and scales with no specific bar requirement as to when this happens; the soloist just cues the change when he/she is ready. The net effect of the use of modes by the Miles Davis sextet on Kind of Blue was to unlock the music and to give it an airiness and buoyancy by helping to free the soloists from the didactic rigors of bebop and hard bop chord progressions. To his credit, Miles had throughout his career looked for new and different ways of playing and interpreting Jazz. This can be seen dating back to his involvement with the “cool” Jazz of the Birth of the Cool band in the late 1940s to his innovative use of electronic instruments in his 1960’s Jazz-Rock fusion groups. However, I am of the firm opinion that while Miles may have been the catalyst for the music that became the Kind of Blue recording, the music itself would not have happened without the involvement of Bill Evans. 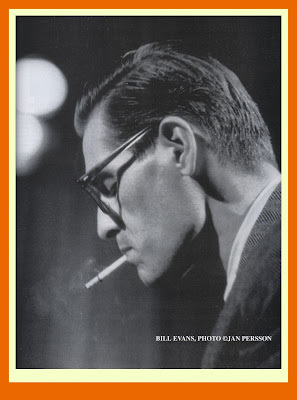 "Everybody Digs Bill Evans was well-received by the critics. “Some of the most private and emotionally naked music that I ever heard,” as described by critic Martin Williams. Gene Lees, then-director of the magazine Down Beat, remembers being so struck by that album that he listened to it over and over for hours, completely enchanted by the emotional content of the music. Lees was so moved that he wrote Evans a simple fan letter, in which he called his music “Love letters written to the world from some prison of the heart. Such an artistic sensitivity so clearly manifest in music could only belong to a someone whose life “must be extraordinarily painful.” The work and faith that Keepnews had invested began to bear fruit. 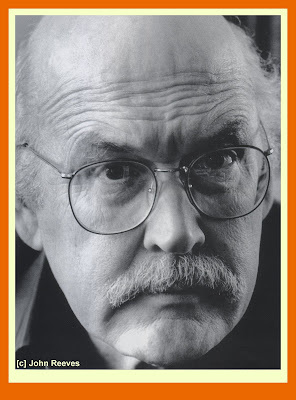 Lees decided to dedicate the cover of his influential magazine to Evans, along with an article and interview with the artist. Notwithstanding Evans' reluctance to accept himself, his name began to spread and people began to recognize and appreciate his talent. He recorded with Chet Baker at the end of 1958, and at the beginning of the following year he recorded a few trio pieces with Philly Joe Jones and Paul Chambers. He wasn’t happy with these pieces though, and made Keepnews promise that they would not be published. A promise that they decided not to keep after listening to them again years later since the music didn’t sound so bad after all. This constant severity with himself would follow Bill throughout his musical career. After recording an album with Bill Potts' orchestra, on which Evans first met a piece that became one of his favorites, I Loves You Porgy (the album offers an overview of the most memorable hits from the musical "Porgy And Bess"), it was in March of 1959 that he arrived at another key moment in his artistic life. Even though he was no longer part of the group, Miles Davis called him to record an album, that very quickly would prove to be one of the all-time masterpieces of jazz. Destined to become a cult album for the most informed of jazz fans, it was, and still is, also able to attract an audience usually drawn to other forms of music. Kind Of Blue [CL1355; CK64935] was recorded in two sessions, one on March 2nd and the other on April 22nd . Evans played on four selections, two per session: So What and Blue in Green for the first, and Flamenco Sketches and All Blues for the second. It was Evans who wrote the album’s liner notes, and it is very interesting to read with what penetrating clarity he analyzes the process of improvisation. 'Discipline' is a term to which Evans would often refer in order to clear up the common understanding of improvisation as a sort of game where "anything goes". He consistently repeated that the opposite was true, that freedom in music only makes sense when there is a solid foundation; otherwise you get lost in arbitrary disorder and reduce the aesthetic value of a piece. This album represents a unique moment of convergence in the artistic paths of these two artists - a bit like one of those intersecting of orbits, that kind of extraordinary astronomic event that happens only once every several hundred years. Evans' piano work had by now achieved the maximum in evocative refinement, the tone of his chords had all but dematerialized; it seemed to speak of far-off abstract things while, nevertheless, maintaining a kind of subterranean tension and a sense of restless expectation. Music historian Wilfrid Mellers picked up on a Debussy-like character in the introduction to So What and throughout the album, noting with insight that, notwithstanding its minimal preparation, one has the impression “of an extremely organized composition, partly because the fundamental material - the melodic phrasing, the chord changes - is very simple,” (the compositional character of this famous fascinating introduction, is also proved by the fact that Gil Evans transcribed it for an arrangement of his own). However, it is Miles himself who provides the most stimulating key to the nocturnal, dreamy atmosphere of this masterpiece when he recalls that “seeing as how we had liked Ravel very much, especially his Concerto For The Left Hand and Rachmaninov's Concerto no. 4, there was some of that stuff somewhere in what we played.” Kind Of Blue, in fact, represented a meeting point between jazz improvisation and some significant harmonic and colorist aspects reflecting the typical French flavor of Impressionist and post-Impressionistic music. The mix was surely not pre-planned, but Evans seems to have acted as a catalyst, capable of "drawing" the whole group towards mysterious places of silence. It could be said that "Kind Of Blue" is, in a certain sense, an album of pauses, of suspensions, where the most beautiful pauses are inevitably "played" by the pianist himself [emphasis mine]. 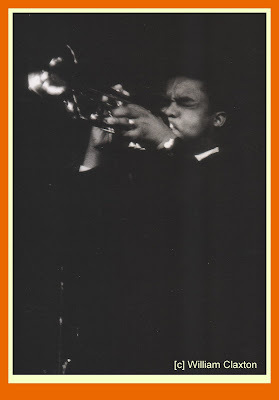 Jazz critic Art Lange observed that Evans' time with Davis - little more than one year, counting Kind Of Blue recorded outside the concert phase, was a decisive moment of passage. His rapport with the audience served him well and, at the same time, he revealed to Miles the possibility of new musical directions. [emphasis mine]. Evans' use of open, harmonically multifaceted chords contributed enormously to making "Kind Of Blue" an album that blazed a new trail for jazz [emphasis mine]. His work with Davis also gave Evans much more visibility. At the beginning of the 1960s we find him ranked third (after Thelonious Monk and Oscar Peterson!) in the critics poll of Down Beat magazine. It was time for the thirty-year-old pianist to put together his own stable group. He called in drummer Kenny Dennis and bass player Jimmy Garrison for a few evening club dates. They played a three-week gig together at Basin Street East in New York, opposite Benny Goodman’s big band, who was making a come-back. All the attention was on that band, and the trio were treated badly (“when we came on the stand we'd find that the mikes had been turned off on us”). Over those three weeks Evans was forced to change bassists four times, and drummers seven. 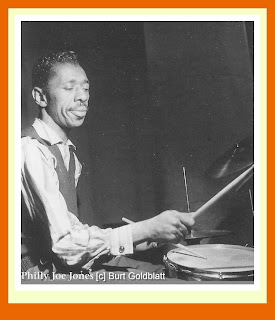 The first to leave was Dennis, replaced by Philly Joe Jones, and at that point Evans was beginning to feel good about his trio. Garrison and Jones interacted well and the trio began to enjoy some success, receiving a warm response from the audience. But Philly Joe's talent was stealing the show from Goodman's big band, who complained to the management that the other group was too good. So Evans was forced to change again, This time fate was on their side. 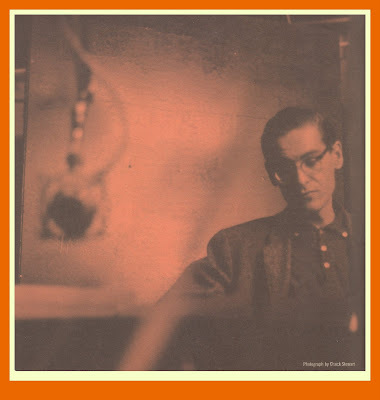 He called in bass player Scott LaFaro (who had just finished a gig with Tony Scott in a club very close to Basin Street East) and, for the last week of that tormented gig, drummer Paul Motian. 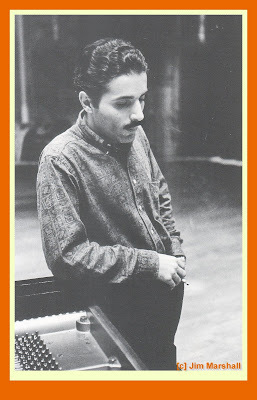 Evans had already worked with Motian on three different occasions over the previous three or four years in various groups, including those of George Russell and Tony Scott. The three were immediately aware of a certain ease in playing together - the music just "happened", so they decided to cancel all other gigs and to play exclusively as a trio. Evans was finally happy and, knowing that he could count on Orrin Keepnews' support, he was sure that he would be able to make some terrific recordings with this trio. A few months to set things up and the trio was ready for its first recording session. Evans had met LaFaro at an audition for Chet Baker a couple of years earlier. He had not been very favorably impressed at the time by LaFaro's rather effusive, show-offish nature. Born in Newark, New Jersey in 1936, he was, after all, still young. 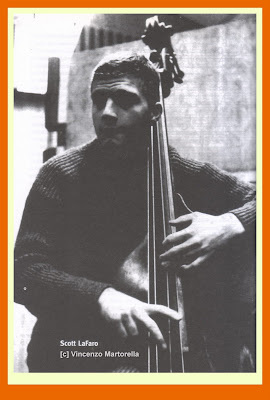 But when the two began to work together with Motian, Evans' respect for the 23-year-old bass player grew rapidly. “He and Paul and I agreed without speaking a word about the type of freedom and responsibility we wanted to bring to bear upon the music, to get the development we wanted without putting repressive restrictions upon ourselves,” Evans himself reported. Singing is a way of being still, we are reminded by Vladimir Jankelevitch, and the silence is itself a constitutive element in audible music. These profound truths are made real in the work of the Evans/LaFaro/Motian trio which, aside from Davis, Lester Young and maybe some coolsters like Lee Konitz, had few precedents in jazz. This music had always been extroverted, communicative and open to the world outside, but in the late 50s it seemed to be expressing a need to withdraw into the artist's most ineffable and interior world. 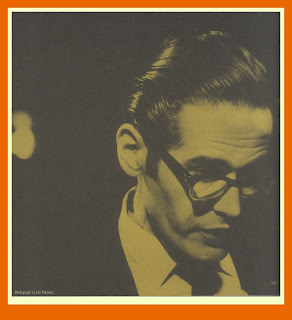 Bill Evans, his music, and even his characteristic physical posture became a visual symbol of this trend: all curled up over the piano he looked like one trying to grasp the intimate nature of the instrument and his own as well. 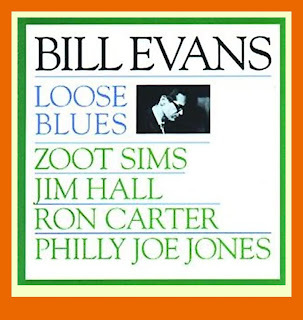 After Kind Of Blue, Evans recorded with Lee Konitz and Jimmy Giuffre, took part in the recording of John Lewis' sound track for Robert Wise's film Odds Against Tomorrow, and recorded many times with Tony Scott. 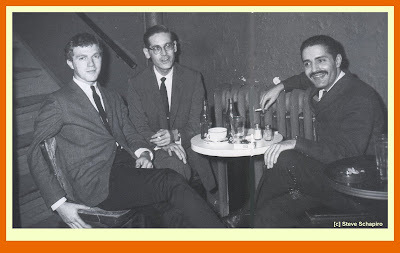 After one more recording with Lee Konitz’s tentette in October, Bill finally got into the recording studio with LaFaro and Motian on December 28th 1959. Evans, at slightly more than thirty years old, was about to begin surely the most important musical adventure of his entire artistic career. Portrait In Jazz [Riverside RLP-1161; OJCCD 088-2] was the first of four albums that the trio were to make - a limited production but of the highest artistic quality, which was to influence whole generations of jazz musicians all over the world. The trio's innovative intentions were only partially carried out in Portrait In Jazz. Evans was aware, as were his partners, that “nobody at that time was 'opening up music like they were, letting the music originate from a beat that was more implied than explicit.” He had a gift for shaping music and a capacity to make every part of the improvisation spring consequentially from the previous one: an approach that the pianist asked his partners to extend to the total form of the piece. When it worked, when the three of them played like one single individual entity, the result was breathtaking. Autumn Leaves (second version) is an example of that success, as is What Is This Thing Called Love. Here the trio offers a glimpse into some completely new mechanisms: like when Motian ventures into audacious multi-rhythmical initiatives, with LaFaro strongly and profoundly accenting the pulse; or when, in the same piece, they experiment with the dynamic contrast between duet (Evans and LaFaro dialoguing while Motian stays silent) and fully active trio. Portrait In Jazz contains some interpretive peaks that highlight Evans' more meditative and lyrical side and the profundity of what he had to say: Spring Is Here, above all. According to Wilfrid Mellers this piece retains the sound mood of Miles Davis. Hc observes that Evans' ability “to make melodic lines ‘speak’ is of extraordinary subtlety... and always the sensuousness leads not to passivity but to growth,” adding that on the album’s fast pieces “the rhythm zest provokes the song.” On Spring Is Here Evans’ piano breathes, and his emotion makes the instrument vibrate with a gentle, resonant sonority - as always, the consequence of the nature of the musical narration that he is improvising and never mere decoration or narcissism. Through a simple song, Evans talks about a part of himself, and the piano is his voice. The performances on Portrait In Jazz are uneven from the point of view of the "simultaneous improvisation" approach, which had not yet developed at the time. The artistic rendition also doesn't always maintain the same level. Evans would later say, for instance, that the version of When Fall In Love on this album was one of the most incoherent and disconnected that he had ever recorded; and, in effect, upon careful listening, one discovers here and there some empty, somewhat ingenuous areas in the construction of the solo. Evans was notoriously demanding with himself and here he recognized some gaps in the logic of the solo that couldn't help but bother him. The opposite was true for Peri’s Scope (in one of the plays on words which he loved to indulge himself in, Evans dedicated the song to Peri Cousins, his girlfriend at the time). The tune is a little masterpiece in improvisational compactness. There is no trace of evident interplay between the musicians, at least in the sense of a contrapuntal or melodic dialogue, but there is certainly a lot of swing and a great elegance here. 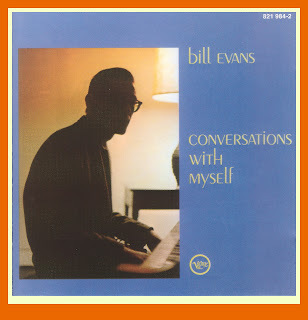 Evans converses with himself; his solo an admirable example of that logical structuring and consequentiality, both main features and his principle objective in music. LaFaro, and Motian accompany Evans in the usual 4/4 time, but with such energy and joy, along with enormous precision, that a kind of precious carpet is woven upon which Evans' rhythmic inner feeling comfortably reclines. Evans displays a very innovative use of the left hand, which seems to move in perfect tandem with that of Motian playing the snare drum. This creates an imaginative, cheerful rhythmical counterpoint to the phrases of his right hand. So, in a little more than three minutes Peri’s Scope leaves an impression of vitality and pleasure in making music not frequently matched in Evans' musical production. In this luminous gem he seems to get back a little of that pleasure of carefree play rarely perceptible in his performances - the piece almost smiles. Finally, in terms of Evans' trio work, Blue In Green should not be forgotten. This is the piece for which Evans had claimed paternity and which, for incomprehensible reasons, was and continues to be attributed to Davis. [emphasis mine]. Actually, Miles, before the Kind Of Blue session, had only given Evans the first two chords, from which the pianist spun the entire composition. In any case, in this trio version of the tune, he doubles the time twice, allowing LaFaro to move completely autonomously, both melodically and rhythmically. Apart from this number, however, the general atmosphere of the album does not sound as revolutionary as the trio's live performances a year and a half later at the Village Vanguard would. More than a year were to pass between the trio's first and second recordings. 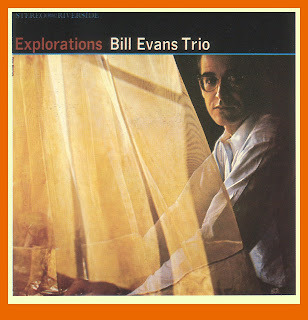 Explorations [RLP-351; OJCCD 037-2] was recorded on February 2, 1961. The demanding, critical Evans was in no rush to record, something which made Keepnews very anxious. The Riverside label was going through an expansion and image-building phase in which Evans played no small part. 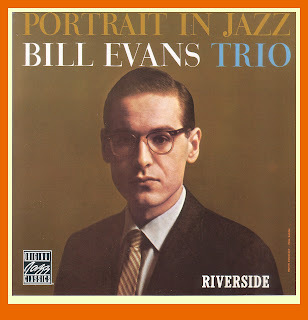 Between Portrait in Jazz and Explorations the trio went on the road, playing a few nights at Birdland in the spring of 1960, but Evans carried on with his activity as sideman. By now he was a deluxe contributor to contexts very distant from him, like J.J. Johnson and Kai Winding's quintet, with whom he recorded in the Fall of that same year, or the four-trombone septet led by Winding himself with whom he recorded that December. He was in dire need of funds. He had to do studio work with various groups other than his trio to support his narcotics habit, a problem that over the years was becoming increasingly serious, and which created a constant need for money. His producer's loans were not always enough to get him out of the disastrous situation that his self-destructive side had landed him in. As if in a sort of double-exposure, Bill pursued his musical objectives with great honesty and intellectual lucidity while his private life was deeply marred. The heroin weakened his perception of an outside world that seemed all too tough to him. It was his refuge, but a punishment as well – the price of such a gift. Shy and introverted, “ I've always been basically introspective,” Evans managed his dependency with that same discretion that we find in his music. Nonetheless, it naturally created enormous problems for him in his personal, and especially intimate, relationships. Music became more and more his ivory tower, where he barricaded himself in an attempt to deny internal crisis. He was moving towards a kind of abstracted intellectual vision, rich in religious sentiment, that barely hid his progressive dissociation and internal bewilderment. (“My creed for art in general is that it should enrich the soul”). Perhaps in this scenario we can find a plausible explanation for Evans' aversion to any sort of musical transgression, even that in which he revealed himself so great a protagonist. His work of 1960 offers a two pertinent examples on this point: the first was the recording of Jazz In The Space Age with George Russell, who had always believed in and encouraged, more than the pianist himself, Evans' innovative talent. The second one was the recording of Jazz Abstractions, two Third-Stream sets of variations by Günter Schuller (one on a theme by Thelonious Monk and one on a theme by John Lewis). A point of interest in the latter recording was that Ornette Coleman and Eric Dolphy were part of the group. These two musicians were hatching the total renovation of the formal models that had characterized jazz up to then, but Evans was evidently not particularly moved. He was going his own way, profoundly rooted in the traditional jazz idiom. While extremely well-versed in 20th century European classical music, and even very knowledgeable about advanced compositional techniques (such as serialism), he was not drawn to experimentation. In Chromatic Universe Part III Russell left room for a two-piano free improvisation: Evans and Paul Bley (a Canadian pianist already part of the avant-garde scene) engaged in a duet with no pre-established layout, threading themselves through the asymmetrical rhythmic background traced by Don Lamond and Milt Hinton. On the surface the occasion could be said to have been a historic one, but in reality the only one who seemed to really believe in it was Bley. Evans showed some uneasiness and struggled to let himself go. A missed opportunity, perhaps, even though the duet offered some very valuable moments. 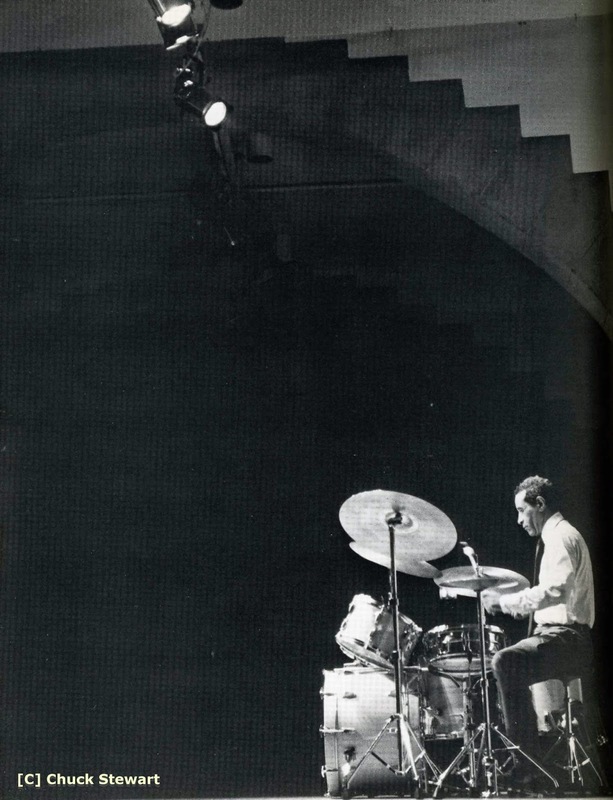 Evans' expressive world, in any case, was decidedly another, the proof of which would be seen a short time later when he went into the studio to record Explorations (February 1961), his fourth personal album and second recorded with LaFaro and Motian. The album was a further step towards that "trialogue", that three-way colloquy they were looking for. Nardis and Sweet And Lovely, in particular, are remarkable results for these three on their way to emancipation from that worn-out pattern of a pianist in the foreground with bass and drums just comping. 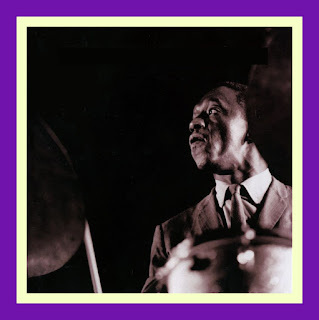 Despite this recollection, and also thanks to the information kindly passed along to this writer by the well-known jazz critic Ira Gitler concerning the numerous, dexterous, and sometimes even bold-faced "misappropriations" that Miles was known for (e.g. : Solar), it is highly improbable that Davis really wrote the tune. It is very probable, however, that it was really written by guitarist Chuck Wayne, whose ancestry was Slavic - which would finally clear up the mystery surrounding a piece written in E minor, a very comfortable key for the guitar but a decidedly awkward and unnatural one for the trumpet. Its composer's Slavic roots would also explain the Oriental over tones of a piece that, most likely for this precise reason, had such a compelling impact on Evans in his final period. To get back to Explorations, Israel and Beautiful Love are, in terms of group work, two important examples of the trio's progress in their desired direction, that of an ever deepening and complex work of "simultaneous improvisation" for three equal partners. In the first of the two selections, as also noted previously with Sweet and Lovely, and perhaps influenced in mood by the ingenious rendition some time earlier by Thelonious Monk, whom it is known that Evans deeply admired, the trio breathes like a living organism. When one of the three starts driving or increasing the sound intensity by means of a stronger musical energy, the other two juxtapose themselves to the new situation. The way Evans does it is to enrich and broaden his voicing, making the piano resound like a full orchestra in which the whole range of frequencies is activated at the same time to flank and enhance LaFaro's energetic outburst. Aside from this group progress, Explorations offers good examples in another area where Evans was having important artistic results: that of ballad interpreting. The "romantic" aspect of jazz (a term that the pianist wasn't crazy about, at least in its superficial and obvious sense) had been, before Evans, the almost exclusive domain of singers or horn players (Coleman Hawkins, Ben Webster, Davis himself, Chet Baker, Helen Merrill). Never, in the history of jazz, had the piano been used as a vehicle to "sing" stories from the heart [emphasis mine]- or their sad endings either - like a trumpet, sax or human voice had been. Evans was a true revolutionary in this. He changed a solidly established tradition, expanding it to include the piano which, before then, had been thought of either as a percussion instrument or as an "imitator" of the trumpet or sax, the most visible jazz instruments. Through some of the slow pieces on Explorations, Evans throws open a door to re-embrace the very ancient popular song tradition, making his songs heirs to the 19th century European Lieder. Just as jazz, in the early 60s, was speaking out in a louder voice to a wider audience (John Coltrane's famous quartet was born, in fact, in 1961), Evans was choosing to go in the opposite direction and speak softly, and the conversation was with himself. If anything, he would invite a few, discreet friends to listen. While Coltrane would steep his music in theological query, and come up with a positive and sure response, in How Deep Is The Ocean or in I Wish I Knew, Evans' seems to wonder, without ever getting to a satisfying answer, about Man, about the meaning of existence, about the "unbearable lightness of being". His music evokes a profound and unconscious reality where the resonant vibration of the instrument, the relationship between one sound and another, between one melodic fragment and the next, become 'psychic images' - a minimum of sounds containing a maximum in human content. “The emotional content of his work was unique in his generation. He could take a standard show tune, originally attractive, yet sullied by the accretion over the years of countless trivial associations, and give it a reading which seemed not merely to restore its pristine appeal but simultaneously to embody a truly personal vision, in comparison with which the basic tune seemed but a desultory thought. His (re) compositions - for no other description will suffice - of such material were carried through with immense discretion, as though the component notes of each and every chord had been subjected to prolonged consideration, as though the rhythmic imaginativeness and flexibility involved in the task, the minute gradations of touch and subtle shifts of emphasis, had been evolved with that one interpretation in mind.” (Michael James in the liner notes of the two 1961 Village Vanguard albums). Three weeks after Explorations, Evans recorded as sideman on Oliver Nelson's great Blues And The Abstract Truth. The group included, among others, Eric Dolphy, a saxophonist from Los Angeles, whose very dissonant and extremely innovative phrasing went well beyond hard bop clichés. Dolphy was soon to be recognized, for his work with Coltrane and Mingus, as one of the most original heralds of the jazz avant-garde, contributing richly to the deconstruction and transformation of the current rhythmic/harmonic parameters of post-bop jazz. Once again the meeting seems not to have produced much of a reaction in Evans. He kept his own pace along that personal path which, in the space of a few months, would lead his trio to astonishing musical and artistic peaks. Perhaps in a less sensational way than Dolphy or Coltrane and some others, these would profoundly, and forever, change the concept of a piano/bass/drum trio, the “ethics" within group improvisation, and the interactive approach of a bass player or drummer in any type of group. Evans' influence on other pianists and instrumentalists, already glimpsed by that time, was destined to gradually equal that of Bud Powell. However, his went much further as a result of the greater number of jazz piano aspects involved, such as voicing, melodic approach, the logic in shaping a solo, tone of the instrument in relation to expressive aims; not to leave out some aesthetic/historical aspects like the rediscovery of the "singing" potential of the piano, no small feature of the late-Romantic and Impressionist European tradition with which Evans generously enriched the jazz language. 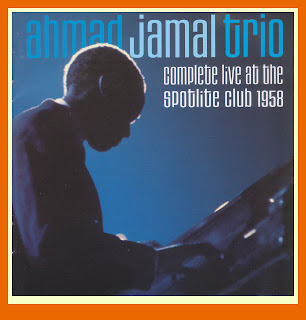 In the spring of 1961, since the trio was going strong, they decided to risk a live album, notwithstanding all the technical problems associated with this type of recording, which was not so common a practice at that time. The planned date was Sunday, June 25th, the last day of a two-week gig at the Village Vanguard. The trio played five sets that day, two in the afternoon between 4.30 and 6.30, and three in the evening, starting at 9.30. A total of thirteen pieces were recorded, five of which only once, others twice, and only a couple (Gloria's Step and All Of You) three times. Some selections had never been recorded by the trio before; another (LaFaro's Jade Visions), turned into a sort of "public rehearsal". Finally, My Romance and Waltz For Debby, which Evans had recorded unaccompanied on his debut album, were re-packaged for the trio setting. The trio reached an apex here that they had been working towards for a couple of years. In one of those coincidences not infrequent in the history of jazz, all three seem to be arriving simultaneously at a ripening of their respective and different talents. Their individual creativity and musicality has peaked, the desire and capacity of each to enter the musical spirit of the other, giving birth to a musical miracle. Although the concert takes place before an audience, the three seem to interact exclusively among themselves and relate only to the music. This contributes to the almost palpable, breath-taking density of these recordings where the musicians follow their itinerary of pure, almost merciless honesty. In the background you hear the chatter and laughter of the audience, but the trio pays no heed. Each of them is totally concentrated on his own sound while carefully listening to that of the others: the inner mechanism of the trio has been carried to its perfect balance. Each of the three completes a little revolution, My Foolish Heart (which Evans records for the first time here) being an excellent example. Here only the melody is played, but the calm sense of humble and participant singing with which Evans interprets Young's song is exalted by the parsimonious interventions of LaFaro, whose profound and resonant notes seem to anxiously await the melody in astonishment, and to dialogue with it. This performance is permeated with the sense of the yet-to-be-discovered, an unknown dimension in which Motian’s role is decisive; in fact, he plays with the melody, making of the delicate contact between his brushes and cymbals emotionally meaningful interjections that closely follow the "little story in music" that Evans is telling. 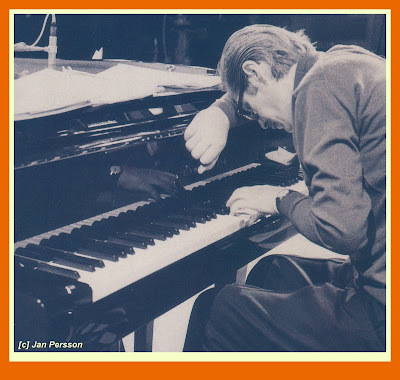 Two of the selections played on that very special Sunday at the Village Vanguard [3RCD-4443-2]were LaFaro's contributions, both deviating from the prevailing compositional habits: Jade Visions, which alternates 4/4 and 5/4 meters, and Gloria’s Step, a theme whose first section unfolds over 5 bars. Here he ventures into a very audacious solo, letting the phrasing of his bass "fly' into a vigorous monologue bursting with the desire to go beyond. His instrumental skills are astonishing, he pushes them to the edge, not for mere virtuosity's sake, but in order to have available the widest possible range of sound and tone contrasts (low notes of the instrument responding to high ones, for instance). LaFaro is the real co-protagonist of this historical recording. His relationship with Evans is telepathic. He inserts himself naturally among the piano's silences and breaths, almost always stubbornly refusing to ‘walk’ as the majority of his colleagues did in those days. Even in All Of You, where he could do it, he breaks up the tempo, thus creating a contrast with Motian. Observing these performances a bit more closely, it is clear that some of the material has to do with Miles Davis, both because they use two of his compositions (Solar and Milestones) and because of some important performances of his (All Of You and Gershwin's My Man’s Gone Now and I Loves You Porgy). All of which is understandable given Evans’ recent association with the trumpeter. Evans plays My Foolish Heart in A major, a key generally considered “awkward" (it is very probable that LaFaro was no stranger to the choice of this key as a way to exploit the open strings of the bass); and My Man’s Gone Now, which the pianist "sings" with deep nostalgic participation, is played in E minor, the same key as his favorite Nardis - both of which keys Evans would claim to love playing in. Their awkwardness, in reality, could help avoid “mechanical" improvisation, since a less common key forces the ear into the highest concentration. On the other hand a piece played in an easier or more common key could encourage a sort of repetitive automatism that counts on what the hands “already know". We find an illustration of this in Alice In Wonderland where LaFaro seems to be suffering for the rather banal and obvious character of the piece.